After almost a year of silence, a new update! The first in a series of new, regular updates. 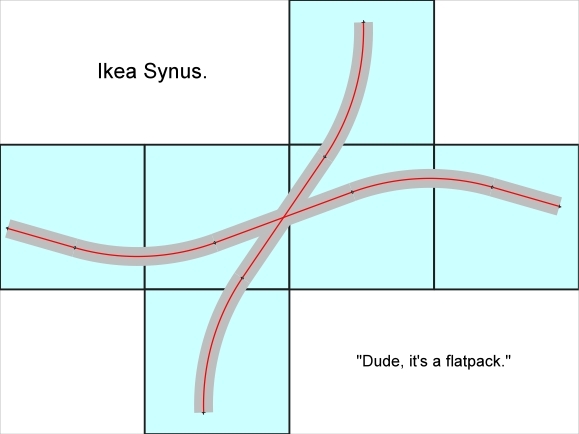 As you might have read, I started a competition last year, to make a micro layout that fits in an IKEA Synas box. I will show you the submissions on this page. Please comment below to let everyone know which layout you like best! 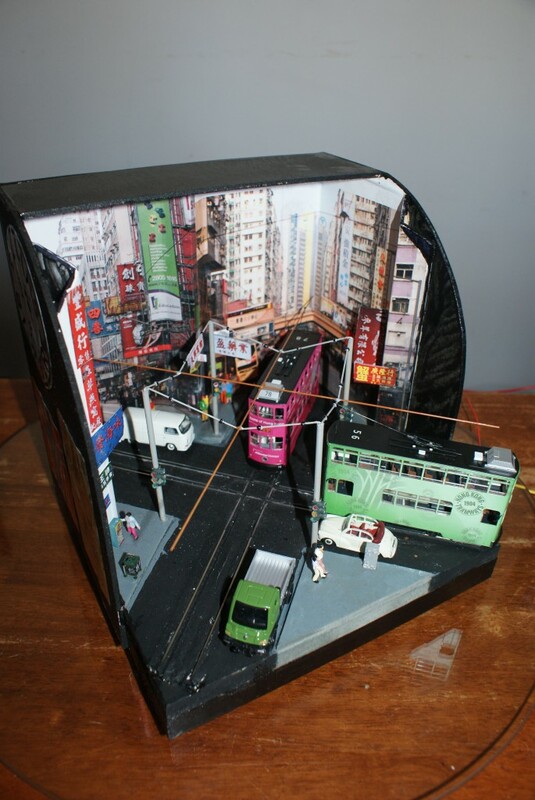 An HO Scale operating Hong Kong Tram diorama by Mark Peterson from Geelong, Australia. When I received the email suggesting a summertime competition I started thinking. The first thought to come to me was that it would be a winter project for us in the southern hemisphere, but that was hardly a problem. A quick look at a ruler exposed the real problem, 9 cubic inches isn’t a very big space. I am lucky that I have a fleet of Hong Kong trams that I purchased on a holiday a few years back but had never got round to building a layout to display them on, what a perfect opportunity. So what could I do with them in that space? 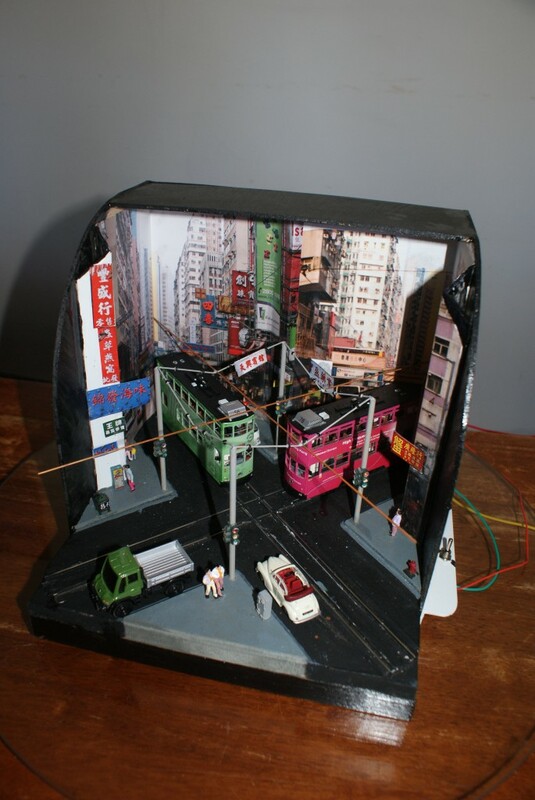 I was looking for a way to display them in a crowded street scene representing Hong Kong but didn’t have the ability / courage to try and build hand laid track with sharp radii or the modeling required for high density buildings. I found a 90 degree crossing track and positioned it diagonally to maximize length of each run. With track laid and wired I began building up the road surface using wood and plaster. (A big learning experience for me.) Once the concept was proven and test runs proved successful, the next task was to go 3D. Street scene images found on the net were printed and pasted into backdrops and around pvc angle to give depth perception. Some signs were cut from images and pasted strategically to also give some depth. Once all this was completed I started to add details such as street furniture, bin, hydrant, relay box and drink machine. Then street poles for supporting the trolley wire were added. These were made from copper tube and had brass wire soldered into position to depict support and contact wire. Very small beads were also used to represent insulators. The trolley wire is not “live” (the trams “spear” their poles in one direction, so do not actually make contact with the wire.) Traffic lights were made from styrene angle and tube with craft jewels positioned and then glued to the poles. Lastly the scene was populated with pedestrians and motor vehicles “squeezed” into position. Control of the trams is by two DPDT centre off switches. Both trams can be operated at once but a collision will occur such is the limited space available. Therefore it is a sequenced mode of operation that someone with more electrical ability could probably automate, (but I’m content to flick switches.) The external walls were painted and laminated images relating to Hong Kong trams glued into position to provide decoration. All up this has taken about 15 hours to complete and has been great fun. 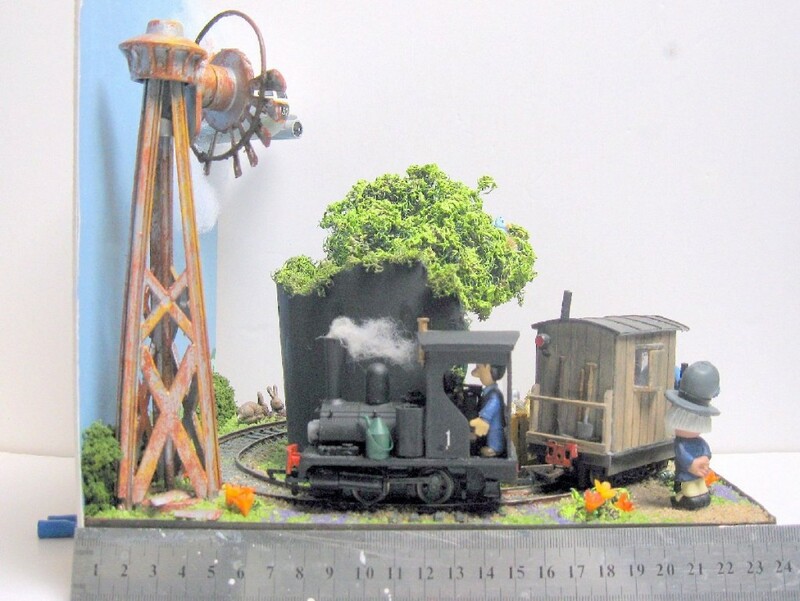 The model is the same sort of scale as my main model railway “Monjouet” – a bit of a mix of O30n and 7mm:ft narrow gauge. 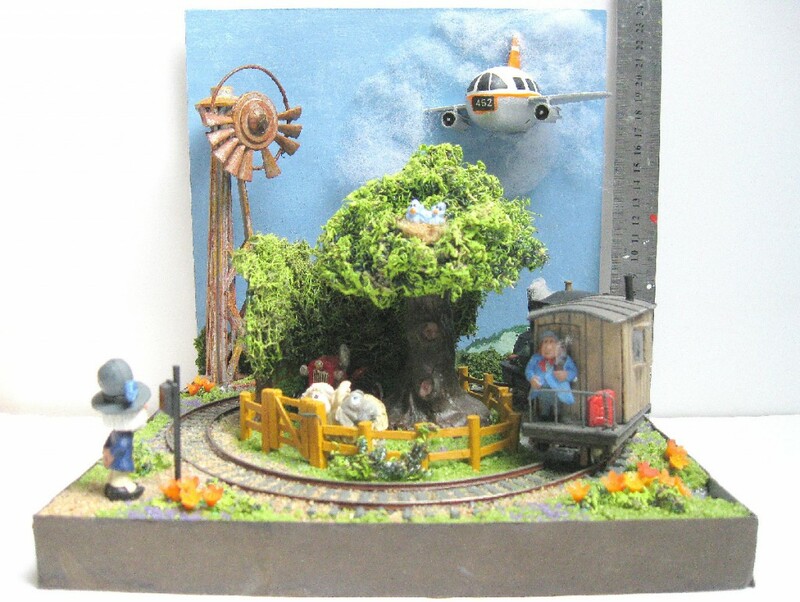 It is built on a wooden base, 24cm square. 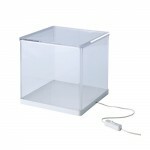 I couldn’t afford the Ikea light box together with its post and packing costs, so there is no cover for the layout, but I have added a 24cm high back scene which I hope will be considered acceptable under the 24x24x24cm size limitation. 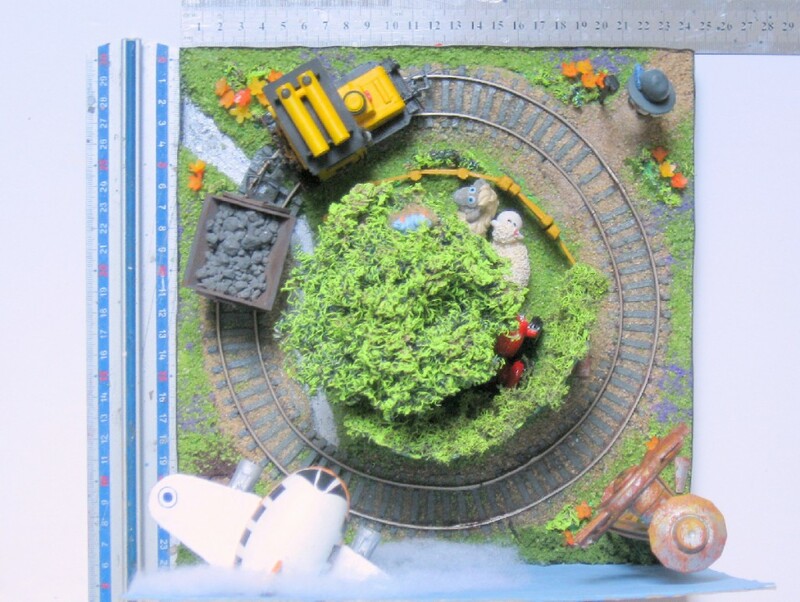 The track is left over bits of OO from older layouts, joined together into a circle. Ground cover is coloured sand with little plastic flowers inserted here and there. Engines and wagons are borrowed from Monjouet and are:- an OO Dapol Pug, adapted to 7mmNg with a bigger cab, etc., and a seriously butchered HO Brawa electric shunter (built up and converted to ‘diesel’). To give the trains somewhere to disappear to, I made a intermediary backdrop of card, fronted with painted trees with lichen foliage. 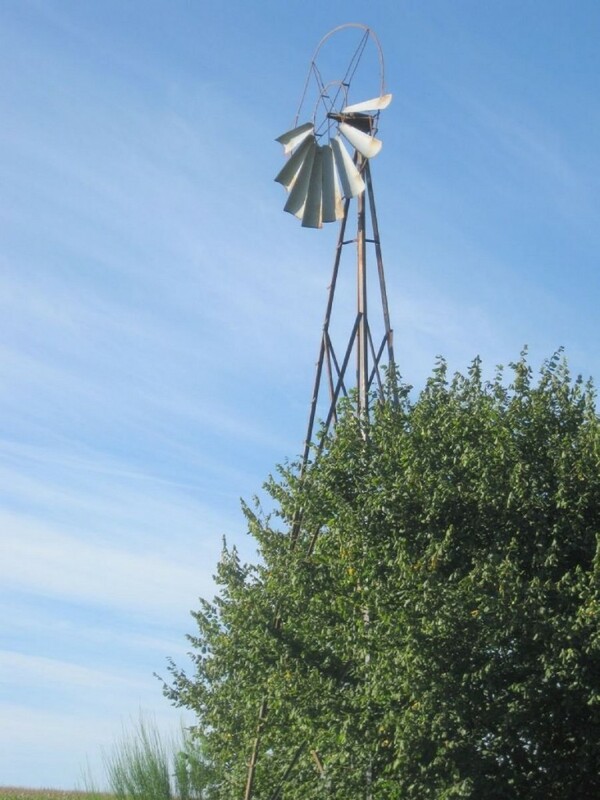 To add height to the scene, I made a wind-driven water pump using a fan from some long-forgotten piece of worn-out household equipment (another item from my ‘may be useful one day’ store). I decided to make this into something of a ‘has-been’ by breaking off half the fan blades and adding a fair bit of ‘rust’ – I include a photo of the example which inspired this, just up the road from where I live. To fill another bit of space on the back scene I modelled an airliner breaking through the clouds. 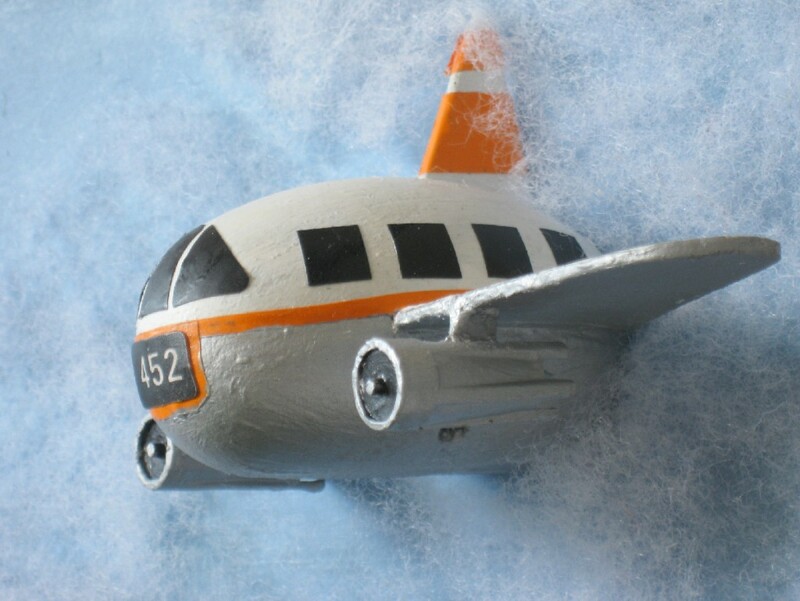 (I guess the pilot will be hauling back on the stick desperately as he finds himself rather nearer the ground than he would wish for!) The body of the plane is part of a plastic key fob thingy that once contained some little model pigs (now enjoying the open air in Monjouet). Wings and tail are from card and engines are made from caps of super glue tubes (very little gets thrown away in my house!). No French farm is complete without a dilapidated tractor rotting away in the corner of a field. Mine came with a wire with a small crocodile clip on the end sticking out of it, and was intended to be used a place setting marker at a dinner party. I prefer cartoon figures to the somewhat staid models offered by model railway accessories suppliers, so buy most of mine from street fairs, where maturing children off-load their childish toys to this childish old man! 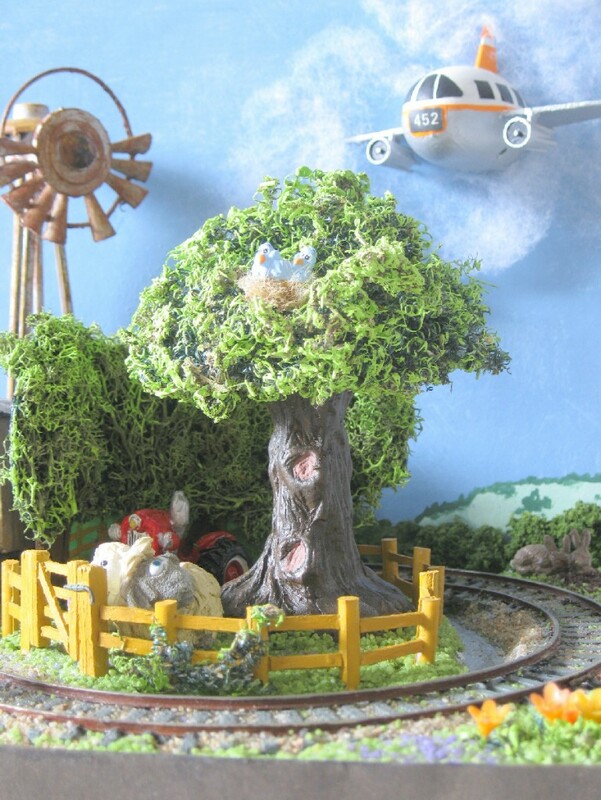 They include two sheep, one of which is interested in the bluebird nest in the tree above, a couple of rabbits, and a farm worker surveying his flock – who is from the Kinder Egg® Magic Roundabout series. These have all come from my ‘people’ stock box. The train drivers, also toys rather than ‘models’, arrived from Monjouet already ensconced in their charges. No doubt there will be some superbly crafted entries, which will leave mine standing in terms of professionalism, but I hope some readers will find this economy model (the only items specially bought for this project were the sprig of little flowers and the tractor) interesting at least. I certainly enjoyed making it. 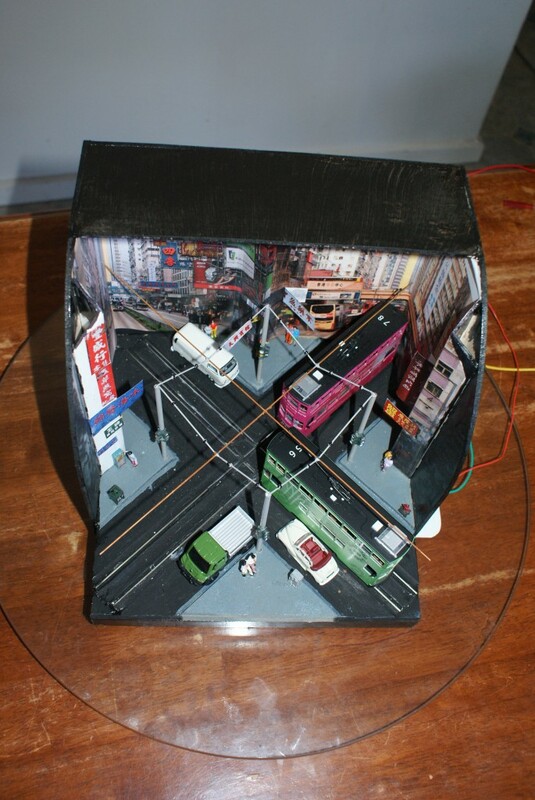 Awesome diorama Mark Peterson.That is thinking inside the square. I love the creativity of Mark Peterson. 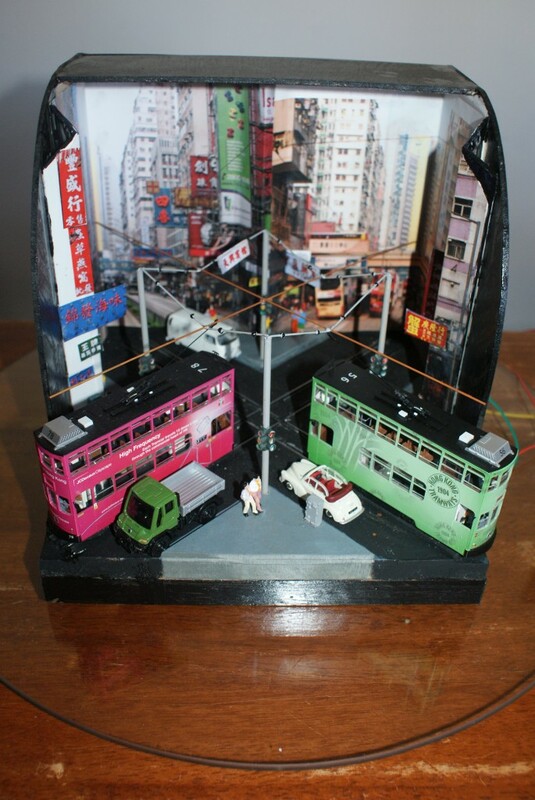 He made a very unique, realistic, operating diorama in a very tiny space using two Hong Kong trams. Great fan of Phil and is Monjouet layout so always interested to see what he’s been up to. Presumably we can expect to see a Magic Roundabout themed train running there soon. 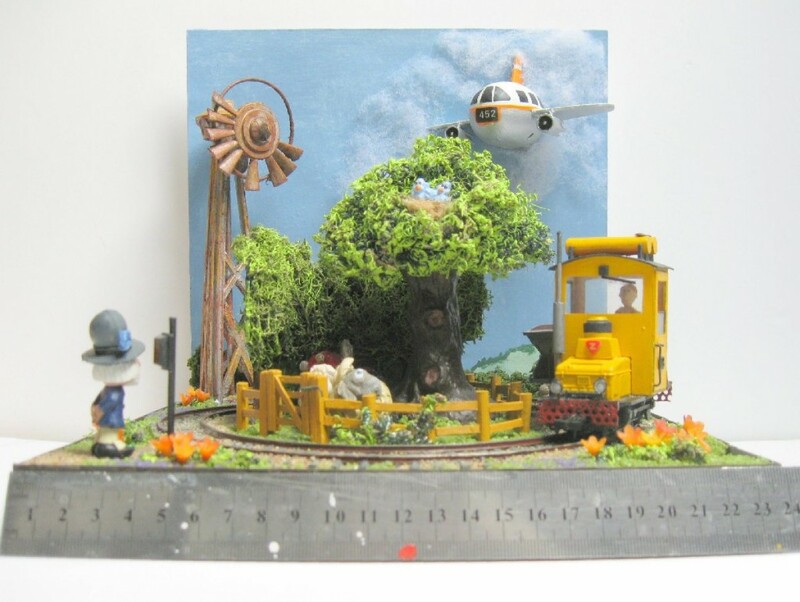 Thanks Gert for keeping the site going now back to working on my metre square Emett inspired layout, photos to follow. 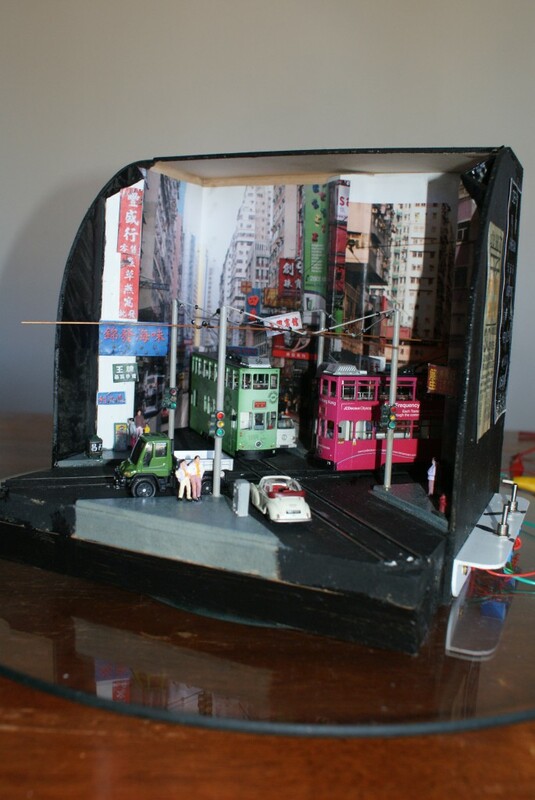 Nice little diorama – great pizza fun – & once again thanks for keeping this site alive. Two great little layouts. The trams are very inventive cramming so much detail makes it a treat to watch operating. Little Pug is great, a magical little layout in the Carl Arendt tradition. Both layouts are very clever, lot’s of detail. Welcome Back, I look forward to the next newsletter. I enjoy your site. Good to see an update, keep up the good work it is much appreciated. Great to see updates. Working on new modules for my Timesaver and Inglenook puzzles. Also in the tradition of John Allan, also a more competitive puzzle of the two Timesavers hooked to gather with an interchange track. The large garden railroad is going away and the large basement railroad is going away as we prepare to move in to a retirement apartment. 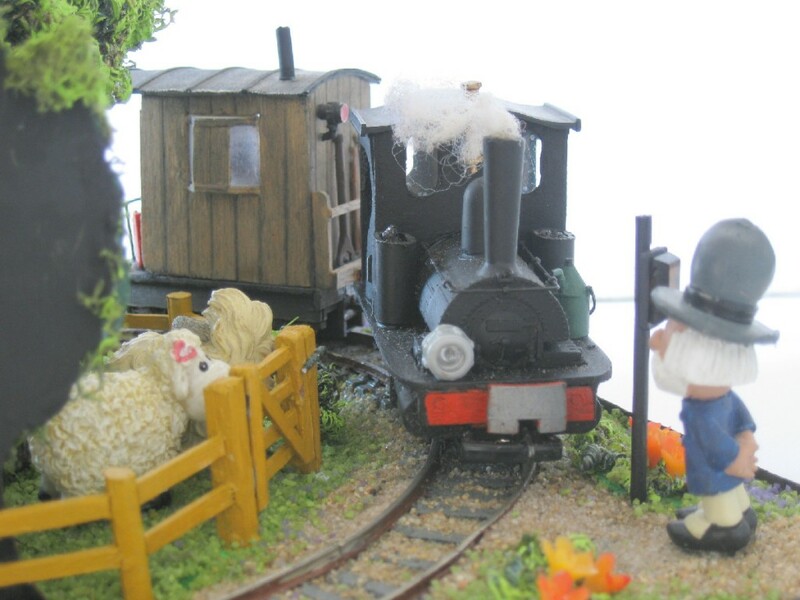 My vote goes to Phil Massey’s charismatic rural French layout, which is filled with charm and a sense of fun. ‘Brawa’ is an inspirational piece of motive power, and I’ll be scrutinizing photos to begin designing a similar diesel for my layout. In a dead heat for ‘best aspect of a wonderful small branchline’ are the airliner buzzing the railway and the Erik Satie soundtrack for the video slide show! Well done! I have been waiting for this. Both layouts are great, but i really liked that little french layout, and when I think about it. Who is going for Hobbit country, anbd building Shire & Wine River Railway? These two are worth the wait. Thanks for keeping Carl Arendt’s work alive. This is the true meaning of “Model railroading is fun”. Gentlemen . These are exceptional layouts . The fact that the trams actually operate is fantastic . 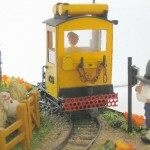 The Rural Railway is whimsical yet realistic as well. Great selection, Gert. There is no way to compare these layouts. Mark’s intersection evokes the tight spaces of Hongkong. Phillipe’s whimsical take on rural France is lovely. Each layout is inspiring in its own right. Thank you! What an interesting way to combine “saved” materials. A bit of whimsy is a good thing! Good to see an update! Been a very long time. I like them both, they are as different as chalk and cheese but both very inventive. Both have lots of character. The tram layout is a very good way of using the space and also very well modelled indeed. The French rural backwater is so characterful and cute though so if I was forced to choose I would have to plump for that one. HO layout, but seem to get more enjoyment from the seven micros I’ve built over the years. Thanks for the update Gert! Great little railroads there! I’m looking forward to seeing other entries for this. Thanks also Gert for the new scrapbook! I miss the updates greatly from this site! Both layouts are inspirational but my vote goes to the trams. Have not seen anything like this before. Creating a figure eight like this would be very interesting. Thank you Gert keeping the site going also. I look fwd to you updates. I’m so excited to see this site up again. It was one of the sites that really got me turned on to the idea of building a “Pizza” layout, which is now in progress. Hope to see more from this wonderful site. Loved both layouts, they demonstrate a lot of creativity. My favorite, though, has to be the whimsical farm — guess I’m a child at heart. Thanks for continuing Carl’s “work” and keeping his spirit alive. I thought both layouts were good, but the Trams got my vote. So much activity in such a small space. Great results, thanks for keeping the spirit flowing. I’m so glad you have revived this website. I have been a subscriber for several years and always enjoy coming back to flip through the pages. I really missed it. I’m looking forward to seeing what you have in store for the future. One question – on the old site there were back “” buttons to easily flip through the pages. I don’t see these now – will you be adding them ? Otherwise, you have made some great improvements, especially with the addition of videos. Thanks again.